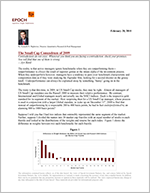 The Small Cap Conundrum of 2009 - Epoch Investment Partners, Inc. The reality is that active managers ignore benchmarks when they are outperforming them—outperformance is always the result of superior genius or the innate alpha of the investment process. When they underperform however, managers have a tendency to pore over benchmark characteristic and composition data as if they were studying the Zapruder film, looking for a second shooter on the grassy knoll. Underperformance can always be explained away by something “funny” going on in the benchmark. The irony is that this time, in 2009, in US Small Cap stocks, they may be right. Almost all managers of US Small Cap mandates use the Russell 2000 to measure their relative performance. By contrast, International and Global managers nearly universally use the MSCI indices. Each is the respective gold standard for its segment of the market. How surprising then for a US Small Cap manager, whose process is used in conjunction with a larger Global mandate, to wake up on December 31st, 2009 to find that instead of outperforming by a respectable 200 to 400 basis points, he had in fact underperformed by an alarming 800 to 1000 basis points? Suppose I told you that I had two indices that ostensibly represented the same segment of the market. Further, suppose I divided the names into 20 market cap fractiles with an equal number of stocks in each fractile and looked at the distributions of the weights and returns for each index. Figure 1 shows the difference in weights between two such benchmarks for each fractile. If fractile 1 corresponds to the largest stocks and fractile 20 to the smallest, it is immediately obvious that the first benchmark skews larger than the second. Figures 2 and 3 show the respective return distributions for our benchmarks. Ignoring the scale for a moment, we can see that during 2009 smaller cap stocks generally outperformed larger cap stocks. Recalling that both benchmarks seek to represent the same investment universe, it would seem logical that the first benchmark, which is skewed towards larger cap stocks, would have underperformed the second during a period when smaller cap stocks had better returns. You would think. However, as luck would have it, in this case you would be wrong. Figure 4 shows that benchmark one, the MSCI US Small Cap, outperformed benchmark two, the Russell 2000, in EVERY market cap fractile—truly extraordinary. In fact, in 2009, the MSCI US Small Cap benchmark beat the Russell 2000 by more than 1250 basis points—an unbelievable amount for two benchmarks that seek to capture returns from the same segment of the market, namely US Small Cap stocks. How could this happen? As the quote at the top reminds us, when things stop making sense we need to return to our premises. The dirty little secret of the benchmarking industry is that nearly all benchmarks are NOT in fact passive. All contain, to one degree or another, a subtle element of active management that during ordinary times is too small to be noticed but that during extraordinary times can cause large divergences from expectations. The answer to our mystery then, lies in the differing ways that MSCI and Russell rebalance their size benchmarks and how those differences interacted with the extreme market conditions of 2009. Figure 5 shows the month-by-month turnover for both benchmarks. The Russell rebalance occurs just once a year at the end of June using market cap values from the end of May. In contrast, MSCI rebalances their size indices four times a year and, in particular for 2009, rebalanced both at the end of February and at the end of May using market cap data from the end of January and March respectively, which happened to bracket the bottom of the market. Table 1 shows the top twenty contributors to the difference in returns between the MSCI and Russell US Small Cap benchmarks for 2009. Of the twenty, none were members of the Russell 2000 and in fact, many had been large cap stocks in the previous year. What happened then seems to be that the MSCI “bought” former large cap stocks that were priced for extinction at the bottom of the market in early March 2009, right before one of the biggest rallies in market history. It is often said that one of the reasons that quantitative strategies tend to outperform over time is that in their blind, systematic way, they purchase stocks that no sentient person would have the stomach to buy. They buy the junk at the bottom, at the point of maximum pain and panic. It appears that the MSCI US Small Cap index methodologically rebalanced into a host of so called “falling knives” at a time when no one in the world wanted to own them. Why did the MSCI US Small Cap outperform the Russell 2000? The answer is that the world didn’t end on March 6th, 2009.